Ah JM, this is simply fabulous! Wonderfully creative solution to a challenging theme, JM. I really like the way you took a picture of the reflection! Very nice JM. So very clever to have a reflection, a shadow, the theme of transportation, and.... RED all in the same photo! Have a good week, JM! Who else would get such an artistic shot of public transport? Great choice for the theme day! Beautiful shot JM. Very creative! Oh, you are soooo artsy and clever! Nice tram photo for theme day, Jose'! Oh la laa...this is cool! Fantastic, JM, as always and you are so very clever and creative! An interesting elaboration on this theme day. The composition and the reflection are awesome. This is very artistic and creative! Such alovely photo for the theme day! Oh yeeeeeees! This is a beautiful photo - fabulously framed, I just love it. Superb! Well seen and well done! :) Bravo!! Great interpretation for theme day! Love that yellow. I didn't participate this month. All we have are buses and I just couldn't think of a way to make that creative! This is a fantastic shot ... so beautiful and unexpected. Foto maravilhosa, adorei o reflexo na janela! Not surprising you would have a clever version of this transportation theme, JM. 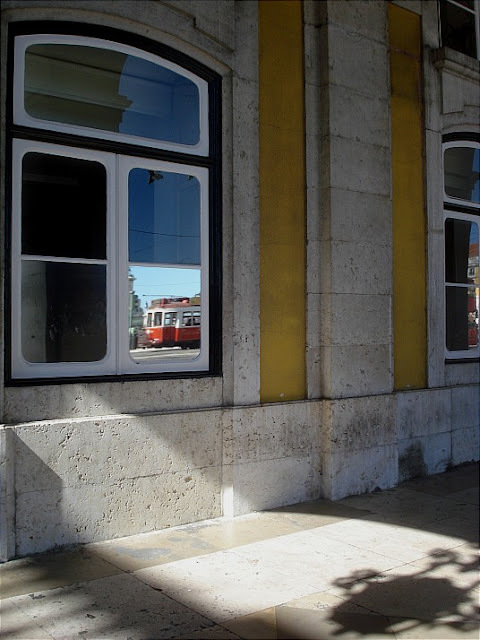 Question: is there no public transit in Oeiras?